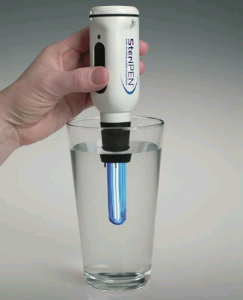 I have had a Steripen water purification device for several years now and have tested it in various locations during this time. Recently took it on the Costa Rica course last month and put it through a few more trials and it held up well. I have to say this is an excellent product if you understand its limitations. Simply turn it on, stick the probe end into your water bottle/glass and then leave in, while stirring, for 48 seconds for 16 oz or 90 seconds for 1 quart. -Delicate so I wouldnt use if backpacking long-distance or would bring Iodine as backup in case system failed. -Won’t work well below freezing as batteries are affected so must be kept warm prior to use in the field. –Only works with clear water, so no murky, silty, or muddy water. Even prefiltering our desert stream water in AZ doesnt get completely settled and therefore UV rays won’t penetrate to the depth of water bottle. In crystal clear mountain streams, it is fine. Overall, I recommend getting one for your home kit for an emergency, or for international travel to treat hotel/restaurant water. For wilderness travel, I would carry a MSR Filter or Iodine or skip the Steripen if lengthy, travel over rough terrain is involved. Take care and enjoy the wilds!